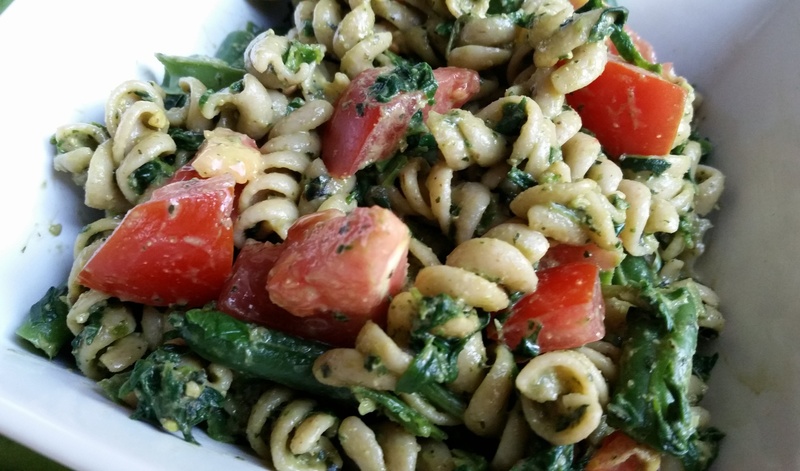 Mindy Celeste made an awesome pesto pasta salad when I was visiting her in Oregon last month. I asked her for the recipe and planned to make it this week. But as often happens with me, I neglected to buy half the ingredients when I was at the grocery store. So I changed the recipe to suit what I had on hand. I was not disappointed with the results. It’s fresh, lively, and made good use of ingredients that came in this week’s vegetable box. Who could ask for more? This pasta salad is best served at room temperature. Set a large pot on the stove to boil. Meanwhile, stir together pesto and spinach in a bowl. When water is boiling, add up to 1 teaspoon of salt, the pasta, and beans. Return to a boil. When beans are bright green (after about 5 five minutes), use a slotted spoon to remove them from the boiling water. They float on top, so it’s not too hard. Don’t worry if you miss one or two. Set the beans in an ice water bath or rinse until cool, then set aside. Pasta should be ready when it has boiled about 8 minutes (just about as soon as you are done dealing with the beans). Drain. While pasta is draining, chopped cooled beans into bite-size pieces. Put drained pasta in a pot or large bowl. Stir in spinach-pesto mixture, then beans and tomatoes. Drizzle with 1-3 tablespoons balsamic vinegar. Serve, garnishing with extra tomatoes or fresh basil if you like.